India’s manufacturing activity slowed to a six-month low in March as orders and output expanded at a weak pace, but it still remained in the expansion zone. The moderation, along with weak core sector growth in February, strengthens the case for a rate cut when the central bank’s monetary policy committee meets later this week. 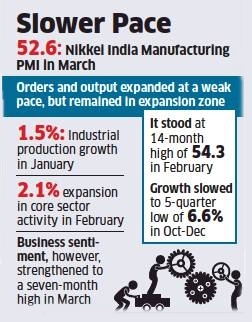 The Nikkei India Manufacturing Purchasing Managers’ Index fell to 52.6 from a 14-month high of 54.3 in February. A reading above 50 indicates expansion and below that mark, contraction. India’s economic growth slowed to a five-quarter low of 6.6% in the October-December quarter, and is expected to have remained soft in the last fiscal quarter as well. Industrial production grew just 1.5% in January, while data released on Monday showed a mere 2.1% expansion in core sector activity in February. Car sales have also remained muted for the last few months. Maruti Suzuki, the country’s largest car maker, reported 1.6% lower sales in March. The PMI survey since January has shown a more optimistic outlook for manufacturing than suggested by government data. Operating conditions continued to improve in March, the survey showed, but noted softer increases were registered for new orders, production, input buying and employment.